A new UWS season always means growth in the league. Usually it is just features expansion clubs, but for the second straight season, UWS added another conference, the UWS Southwest! The conference was fully formed in May of this year, so the start of the season for the clubs included in the Southwest was delayed until the first weekend in June (a month after the rest of the league). Even with the late start date, the Southwest has gone through the first half of their season in just four weeks! All statistics are up to date through June 24th. Houston Aces are the most veteran club in the new conference. They played in WPSL from 2012-15 and have been members of the UWS since 2016. Starting this season, the Aces expanded a working relationship with the NWSL’s Houston Dash to allow player exchange opportunities between the clubs. The relationship is similar to that of MLS squads using USL clubs to develop or rehabilitate players until they are ready to play in the top division. The relationship has vaulted Houston to first place with an astounding goal differential of +26! The next closest goal differential is third place North Texas Image with a -2 differential. It doesn’t look like anyone is stopping the Aces in the Southwest! Statistically, the Aces are led by Forwards Gisela Arrieta and Julie Gavorski. They are tied for the team and conference lead in goals with seven apiece. Goalkeeping is led by Anna Hughes, who has yet to let in a goal in three games played. FC Austin Elite is another veteran club joining the UWS Southwest. Elite played in WPSL from 2015-17. Elite games (with the exception of the loss to the Aces) have been extremely competitive. Four out of their five games have been decided by two goals or less with action in all 90 minutes played. Their remaining three games feature an opportunity to avenge their two losses of the season. They play both Houston and ASA El Paso at home, giving Elite a great opportunity to shoot for a conference crown. Statistically, FC Austin Elite are led by Forward Christina Artega. Artega leads the team in points with five and in goals with four. Goalkeeping is led by Paige Wallace, who leads the team in wins with two, goals against with one, and saves with nine. One of the three regional/youth clubs that made the jump to the UWS this season (others HAR FC and ASA EL Paso). Every game in their first season has ended in a shutout, losing to top teams Houston and Austin and defeating HAR FC in back to back 3-0 wins. Good news for the Image is they face El Paso in two of their final three games, so their place in the middle of the conference should be safe this season. Statistically, the Image are led by Forwards Mackenzie Scovill and Valiree Morris. Scovill leads the team in goals with two and points with three, while Morris is hot on her heels with two goals. Goalkeeping is led by Courtney Burnette, who leads the team in minutes with 314 and saves with 22. Unlike their counterparts in Houston, HAR FC is completely made up of college players. Similar to the division four teams in men’s soccer, teams in the UWS are either all paid professionals, or not paid at all if they have college players to comply with NCAA rules. 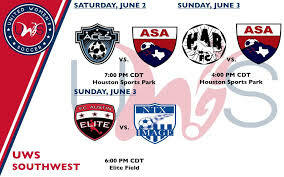 We will see rather the pro players or the college players will reign supreme in the next two weeks, when HAR and the Aces face off twice in the ground they share, Houston Sports Park. Statistically, HAR FC are led by Midfielders Sabrina Munguia and Stephanie Garcia. Munguia leads the team in goals scored with three, while Garcia leads the team in assists with two. They are tied for the team lead in total points with three. Cailey Croson leads the team in goalkeeping, giving up five goals and making 13 saves in 270 minutes played. ASA El Paso has struggled during their inaugural UWS season. Their surprise 5-4 victory against Austin has started their path to play spoiler on the right foot. They can really throw a wrench into the race for a Southwest crow with a rematch against Austin and two games against North Texas. An El Paso sweep of Austin would all but seal the championship for Houston. Statistically, El Paso is led by Forwards Desiree Morgas and Nichole Cohen. Morgas leads the team in goals with three and Cohen leads the team in assists with two. They are tied for the team lead in points with three. Goalkeeping duties have been split between Meagan Smith and Jennifer Solis. Smith has made 15 saves and given up seven goals, while Solis has made nine saves and given up eight goals. Each has played 135 minutes between the pipes this season.